I did these fashion inspired nails a few months ago, and have been meaning to recreate them ever since - today I did! In completely different colours though. 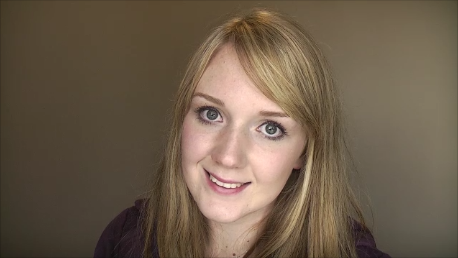 I like this video best so far, simply because I got a haircut today and my hair has gone from boring to awesome! So happy with it. Spent a pretty penny though, so good thing I have full-time work now :o. Again, they were all amazing to work with and such pretty colours! I'm finding it really hard to know what to name these nails! The last ones were inspired by my top, but these... I just don't know! I asked on Facebook and am getting lots of good ideas :). Update: Abstract candy floss it is! Here's my new hair! I just had to share, I love it lots. As a side note, I don't know exactly how it happened, but in the last few years (and particularly the last few months) my life has gone from pretty average to pretty awesome. I've been consistently happy for a long time, and it's a good feeling. Nothing lasts forever but I'm going to do my best to appreciate the now! I hope you're all enjoying life as much as I am at the moment :). Awesome! This is definitely something I will try for myself. Not too difficult and not too detailed! Perfect!